Today marks the best of days and today marks the worst of days. May 28 or as a true patriot would call it “Youm-e-Takbeer” marks the day when Pakistan registered its might in modern warfare and arsenal by successfully conducting a controlled nuclear explosion. Pakistan with its sensitive and strategic geographical location also became armed with perhaps the most powerful weapon (though there are some who still believe education is the most powerful weapon). Pakistan had the attention of the world and especially had its good neighbor, India, and our favorite piñata (minus the candies), Uncle Sam, up in arms. What followed was a series of embargoes – the Rupee being devalued by 50% and the then Nawaz Government being left with no option but to freeze US$10 billion in private forex reserves. Interestingly, according to Nawaz Sharif himself, he denied an aid package of US$ 5 billion by President Clinton which was offered conditional to Pakistan not carrying out the tests. 15 years later, one may ask how has the common Pakistani actually benefited from Pakistan developing its nuclear arsenal? We currently have surpassed India in terms of our nuclear reserves and by some estimates are scheduled to take the third place after America and Russia in terms of nuclear bombs by 2020. Between the Ministry of Water and Power and various government bodies, Pakistan’s electricity demand is 14,000 to 17,000 MW. Appallingly, our nuclear program which has produced over 100 bombs produces less than 1000 MW electricity for the country! This looks even sadder when one recalls history as back in the 1950s under US President Eisenhower’s Atoms for Peace Program, Pakistan, India and Iran were supposed to be prototypes of promotion of positive use of nuclear energy such as electricity. However, given Indian intentions of building a bomb, Pakistan joined the rat race. The nuclear bomb has not entirely been a waste. It does serve as an undeniable deterrent keeping violence from escalating between India and Pakistan when unfortunate incidents like 26/11 take place. Saudi Arabia which vicariously massages its Muslim ego through Pakistan on military turf has been visibly happy with us since 1998. It is also the one and only (and wrong) reason for proud patriotic Muslims to call the country the “Fortress of Islam”. Where many beam with national and religious pride on May 28, to me at least it is a day or mourning and national embarrassment. Where so many of us recall hills and mountains moving in Chagai with the thunderous roar of a successful nuclear test, how many of us reflect on the massacre of members of the Ahmadiyya Community at Lahore? The attack took place at the Community’s house of worship which I am not legally allowed to call a Mosque. 94 people were killed and more than 120 were injured during Friday prayers. The so called Fortress of Islam could not protect the people inside it. US did not need to put an embargo or send a drone nor did India need to conduct any covert operation or surgical strike. It was the work of home bred terrorists who continue to creep into our mosques, cultural centers and streets and are not limited to FATA anymore. Various political parties had issued statements of condemnation when the attack took place but no prominent politician was seen at the mass funeral held at Rabwah for the victims. Tehreek-e-Taliban Pakistan along with the Punjabi wing of Taliban (considered to have links with Jaish-e-Mohammad, Lashkar-e-Jhangvi and SSP) accepted responsibility for the attack, the same group with which the current Nawaz government is gearing to negotiate with. The Lahore massacre is perhaps just the tip of the iceberg. It defines the circumference if our society is conceived as a circle. The genocide of the Hazara community and the targeted killing of Shias in Karachi (three including two children were gunned down today) is a clear sign that this circle will keep getting smaller and smaller. Our grudges and holier than thou attitude had dehumanised us to the extent that now we do not even condemn brutality or terrorism if our own kin has not suffered from it. To those who want to continue to live in the bubble with their misplaced sense of nationalism believing that Pakistanis are gatekeepers of jannah and Pakistan is the cradle for the next holy army, remember May 28 for the successful nuclear blasts. But those concerned with struggling to return basic human values and rights to this society, remember May 28 as also the day we failed our people. And after 48 years Pakistanis are eating grass and leaves, some even cannot afford the grass..
Well done, once again, Jibran. We need more people like you who have the courage to take up what the real issues are. Good to see that there are people like you who have an alive man’s conscience to also remind us of the Ahmedi massacre that occurred on this very day that we shamelessly continue to celebrate with much hollow pride What good would a bomb bring to a country where the minorities are not guaranteed the basic dignity to survive as equal citizens. Agree with @Umair. There is no link between our nuclear arsenal and the sorry state of our country, society and economy. We have a nuclear arsenal because the people entrusted with building it were honest, hard-working and competent, something which can never be said about our rulers and administrators. For the entirety of our existence we have been ruled over by incompetent, selfish and corrupt politicians, bureaucrats, generals and economic managers. And when sh*t hits the ceiling these idiotic pseudo-liberal bloggers start bad-mouthing everything good that we have, our faith and the nuclear arsenal. unfortunately there is no archive of newspaper of 1998. if we can see the statements from leaders of shining and incredible india may be we ll have a better view of the situation in 1998.
decisions are easy to assess after they are made, imagine a non nuclear pakistan. wht stopped india to invade pakistan in 2001 after one of the bigget military stand off and again after mumbai attacks? we cry daily on drones, but wht stopped US from going all out on pakistan? about the number of nuclear arsenals, pakistan doctrine is to use smaller bombs for targeted attacks. also when we see reports of US forces ready to take over pakistani nuclear, may be pakistan has to maintain large arsenal to safeguard against such threats. Well Mr. Umair, the bomb has a lot of connection with the living standards of the people. 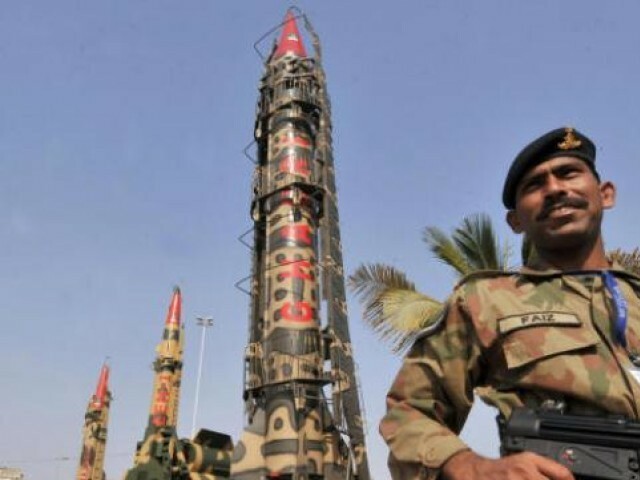 Pakistan is currently reported to spend around $2 billion on nuclear weapons per year if we include the environmental and health costs and this figure will rise as Pakistan expands its nuclear program. This is a very large given the fact that our total national foreign reserves at its peak was $16 billion. I am quite sure that you aware of the state of our government schools and health facilities so please tell me if $2 billion is a large figure or not? When I read the headline on Google News the first thing came in my mind was that the article must be published in Express Tribune and I was right as this is the only newspaper which relies more on propaganda and less on professionalism. Almost always lacks balance in its editorials and even in reporting on certain issues. The bomb was for the people. Before the bomb India cut Pakistan into two in 1971, attacked us in 1965 and captured Siachin in 1984. After the bomb Pakistan initiated Kargil and Kashmir. India could not dare to repeat 71 despite stationing its troops on Pakistani border for 11 months in 2000. The best economy in the world is that of America and China and both the countries are military powers. Kuwait had/have most valued currency and can be termed as most prosperous country in the world from almost all aspects but could not defend its territory when attacked by Iraq. Israel is just like a dot on earth map but is living like a dagger in the chest of Arabs due to its military might. So the people can live honorably when their defense is strong. And they can afford eating grass within their own boundaries only when their defense is strong otherwise they may not afford the luxury of ‘eating grass’ within their country. I watched you explaining your Manifesto on Faisal Qureshi’s Morning show with a PTI youth candidate. I was really impressed by your school of thoughts. The way you pointed the serious issues like Karo Kari, Wanni in the urban parts of our country and Shia genocide as a time bomb we created with our own hands and now sitting on it, in which no NATO or Israeli or American lobbies are involved, was just too extra-ordinary. I myself never pondered over that side of the picture. If no one else, your perspective and also this blog awakes me. -Pakistan named one of its nuclear missile systems Abdali after Afghan king Ahmed Shah Abdali, oblivious of the fact that in the Third Battle of Panipat, after he was invited by ShahWaliullah to invade India to ‘protect Islam’, Ahmed Shah Abdali invaded Kashmir, burned the city of Lahore and killed tens of thousands of Indian Muslims in what is now Pakistan. -Pakistan possesses more than 110 nuclear warheads capable of producing enough energy that can destroy half of the world, but does not have enough electricity to meet the basic needs of its population. The country continues to suffer the worst and the longest power outages and the industry sits idle for 14 hours every day. -As by 2011, Pakistan spent seven times more on arms than on schools, while Pakistan has one of the world’s largest out-of-school populations. The discrepancy is so large that only one-fifth of Pakistan’s military spending would be sufficient to finance universal primary education in the country. daily routine,we could,nt resist to american pressure after 9/11,we have become isolated from the rest of the world. I liked the spirit of the article, but don’t fully agree with its logic. Let me ask a question to make my point : If we had not developed the bomb do you think we would have had a decent governance system, no power shortages, a credible judicial system, a decent educational and health system etc, etc………………I think not. The writer of the blog needs to understand that the issue of current energy crisis is different from Pakistan’s nuclear deterrence. We cannot blame the scientists who developed the nuclear bomb for the shortage of electricity. It was the responsibility of the governments to have had made efforts for the construction of dams and barrages. If the writer thinks that the detonation of nuclear devices is linked with current energy crisis, then i am sorry to say that he is wrong. If Pakistan would not have had conducted the nuclear tests, then India would have had waged war against Pakistan. It is due to Pakistan’s nuclear deterrence, that India failed to wage war after the attack on the Indian Parliament. Even though it had deployed its troops at the LOC for this purpose. On a positive note there will never be another full scale Indo Pak war unless suicidal tribal crazies take over the administration of Pakistan, which I think will never happen through ballot. One nuclear reactor can significantly reduce the power shortage in Pakistan. @Abdullah Nizamani: Thank you for your enlightining thoughts Mr. Nizamani…but do you or your servants, or the shopkeeper, or the milkman, the police man, the fruit seller, the judge, the teacher etc have been eating GRASS since then? What the supporters of nuclear technology and extremely tunnel-visioned jingoists have in common is an innately inadequate and in many cases flawed conception of the very technology they defend. Nuclear technology cannot be examined on the common barometer of conventional warfare, as by the virtue of it’s devastating force and ability to wipe out entire cities means armies think twice before deploying them. Most hard-line jingoists are pointing toward the theory of MAD (Mutually Assured Destruction) which, I agree, has prevented the escalation of military crises with India and prevented the total hegemony of the West being imposed on us. MAD ensures that conflicts don’t arise simply because an escalation into nuclear war between competing countries would lead to both countries being bombed to bits. However, the cornerstone of MAD, is not the number of nuclear warheads or how fast they can be deployed, but the NATURE of nuclear weapons. Even if Pakistan and India disarm, and have only a few warheads left, the theory of MAD will apply between them and towards West as well, because of the devastating nature of just ONE warhead. What should have happened was that a limited arsenal, adequate to ensure our security interests are met, should have been made. The resources would then have been channeled into healthcare, education, sanitation etc. which could have tangibly improved the lives of the masses. And after the Bomb Pakistan lost Waziristan to a rag tag bunch called Taliban. It lost Swat to Mullah Radio and people of Swat are still living as IDPs. And now Pakistan is going down on its knees in surrender to the TTP. As others have pointed out, Pakistanis are suffering from lack of food and other necessities yet the government has allocated a disproportionate amount of funding to the nuclear program — money which could have helped the economy and condition of the general population. Perhaps the argument here is that we had a sufficiently threatening nuclear program for defense purposes, so there was no need to keep building it up to present state, when we clearly could not afford it as a nation. Secondly, being a nation where the average person is suffering economically, being a nation where there is no law and order, and being a nation where mass massacre of minority communities is soon ignored as if it never happened, or worse, as if it should have happened…there is no sane reason to strut around merely based on the fact that the country has nuclear weapons. I think considering world politics, a nuclear weapon is pretty much all Pakistan has going for it at present, but one should not be boastful about it. If one is actually religiously motivated, one should prostrate before Allah the exalted, in sheer humility that despite all the crimes and injustices that go on in the country, He has given Pakistan this crutch to stand on.